We knew that when they did it, they were going to do it in style. 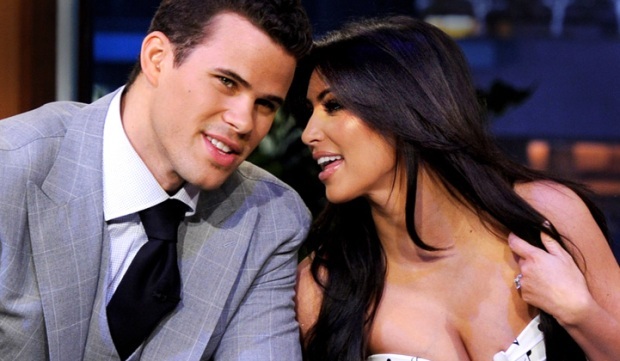 When reality star Kim Kardashian and New Jersey Nets forward Kris Humphries tied the knot over the weekend, the event was exactly that: An event. And now, as with any big event, the breathless coverage is kicking into high gear, while the world waits for the official record of the wedding to be broadcast in a two-part special on E! Oct. 9 and 10, while People magazine will have all the wedding pix this week. "God is good!!!!!" Kim tweeted Sunday afternoon, as bit and pieces about the grand to-do leaked across the Internet and were duly recorded on every entertainment Web site and show around. After all, the Kardashians are reality stars and business folks of the highest order: The Web site Mogulite estitates they'll take in around $18 million from the wedding, primarily through sale of the media rights. Sporting a blindingly bright, custom-designed 20.5-carat Lorraine Schwartz engagement ring during the ceremony, Kim was accompanied down the aisle by her stepfather, Bruce Jenner. Sisters Kourtney and Khloe were her co-maids of honor. Kim also made sure to honor her late father, Robert. "I so wish my dad could be here today to walk me down the aisle. But I know in a way he is here, and I feel his loving presence all around me. I love and miss you, dad," read a statement in the wedding program. Singer Robin Thicke introduced the couple for the first time, before singing his song "Angels" as they enjoyed their first dance. As if the guests needed any more encouragement to hit the dancefloor, they were treated to a surprise performance by legendary soul band Earth, Wind and Fire. The happy couple exchanged wedding bands that Schwartz also made, and their vows were reinforced by Pastor Joel Johnson, who called Kris "the ying to [Kim's] yang." Congrats came in on Twitter Saturday from everyone from Wang to Kim's family to former boxing champ Sugar Ray Leonard. It's the first marriage for Kris and the second for Kim, who was married to music producer Damon Thomas from 2000 to 2004. The entire Kardashian clan was ushered from the ceremony in a fleet of Rolls Royce Phantoms and Maybachs to the reception. Well, make that reception #1. The couple plans a second wedding party to be held at an as-yet-unidentified New York location 10 days after their wedding. Celebrity wedding planner Colin Cowle is handling the details. The honeymoon will have to wait until summer 2012, as both Kim and Kris will be plenty busy for the foreseeable future. Kim and Kris first met back in December 2010, when they were introduced by Humphries' Nets teammate Jordan Farmer. The two were engaged six months later. Selected Reading:People, Us Weekly, E!